I dropped them off at the library yesterday for the Friends of the Library annual booksale. At points in the whole process, I felt regret (“I may miss that book someday”), puzzlement (“where- and whenever did we acquire that? ), irritation (“what possessed me to haul that along all these years and miles?”), bemusement (“oh yeah … what was I thinking?”), and, most of all, gratitude: for writers, editors, words, and the Word. Comments welcome … why is a book at once so difficult and so easy to shed? Happy Valentine’s day, dear readers! We hope whatever your weather, it’s warm at your hearth and in your hearts! Though we haven’t posted lately, we haven’t been idle at Casa de WIST. We re-mortared the field stones that were loose in the fireplace surround and painted the sitting room. (At last!). And we’ve undertaken the soul-searching and muscle-straining labor of culling our library. How many books do an academic and a philosophically-and-theologically-trained clergyperson acquire in years, nay, decades of voracious reading? We don’t actually know … we gave up counting long ago. But: lots of lots. We knew when we committed to lightening up that shedding books was going to be hard. Some are such good friends … others involve long- and closely-held hopes … and collectively they come to such a sunk cost. But we’ve come to see that, though a few books are tools of our trades that we use over and over, most are like meals we eat. Once we’ve enjoyed the experience, we should pass them on so others may as well. 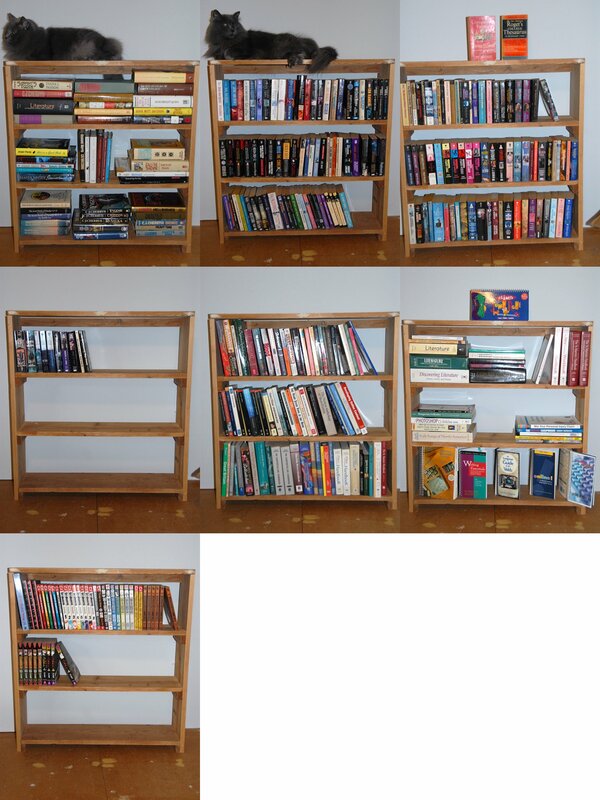 It’s crazy to build more and more bookshelves to hold them while they fade and gather dust. A church nearby occasionally rents tables for rummage sales, thereby raising funds for good works. Last fall we took mostly housewares. 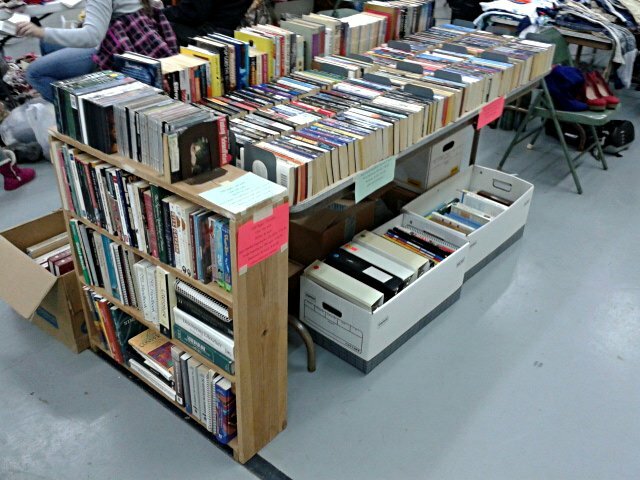 Today we set up a used bookstore for a half-day. Nimue’s bookstore … hardbacks cost a buck, trade paperbacks 50 cents, mass-market paperbacks a quarter, or five for a dollar … we aren’t getting rich this way. I don’t think we have second careers ahead as booksellers, but a few dozen books are now in the hands of new readers. Most importantly, we have several boxes full that we’ve already mentally parted from; we just have to decide on their destinations. Options abound: thrift stores, our community “Friends of the Library” booksale, Better World Books drop-off boxes, a venerable local used bookstore, and (for a very few volumes) internet resellers. “Of making many books there is no end,” Ecclesiastes said, “and much study is a weariness of the flesh.” Ecclesiastes was frequently a grump. Let books abound, we say! Let them never settle too long, but circulate! Comments welcome … any ideas for other happy ways to pass books along?